We bring a breadth and depth of expert knowledge and experience to each project. IEG is a small company of highly educated and experienced professionals consciously assembled to provide expertise in practical applications of ecological and cultural research. We are dedicated to working at the interface between humans and their environments, and apply innovative approaches to specific challenges in ecosystem and cultural assessment, repair and support, and land-use management. 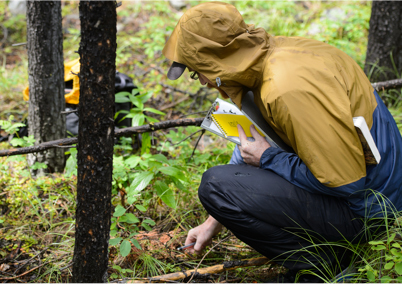 By bringing together the areas of ecology, ethnoecology, reclamation monitoring and sampling design, cumulative-effects studies, and land-use planning, we work across a variety of technical disciplines to deliver the best in applied ecological and cultural research. Our small size and wide expertise allow us to be agile and focused in responding to our clients’ needs. IEG has offices in coastal British Columbia, southern Alberta and northern New Mexico. IEG was founded on the principle that humans are an integral part of the natural environment. Our lives wholly depend on the existence of healthy ecosystems, but our practices can cause substantial stress to these systems. Thus the health of our societies relies on our ability to responsibly maintain and repair ecosystem health. IEG’s work is focused on innovative research and approaches to promote healthy ecosystems and cultures that support goals of responsible stewardship and management. IEG is committed to improving the ecological, cultural, and social wellbeing of people and the planet. IEG is an owner and core member of the ALCES Group. ALCES is a world leader in the delivery of land-use cumulative-effects modeling tools, strategic land-use planning advice, and the provision of practical strategies to assist government, business, and society. ALCES assists clients with developing strategic plans for triple bottom line - people, planet and profit. It is a unique collaboration of planners, environmental scientists, and computer simulation programmers who share a deep commitment to helping clients make balanced, informed decisions that achieve environments in which we and our grandchildren can thrive. We work with clients across a range of sectors, including indigenous and other local communities, industry, government, and nonprofit organizations to support the development of sustainable land-use and policy decisions. We believe that good work should be done by people who are true experts in their fields. Because we are a small and focused company, we actively seek collaborators in universities, nonprofits and other companies to complement our team, and to expand the breadth and depth of knowledge we can offer to our clients. Donald Functional & Applied Ecology Inc.
Kwusen Research and Media Ltd.